Just before we left home, Kenna had a crazy idea: was there some way we could fit in a quick trip to Berlin? 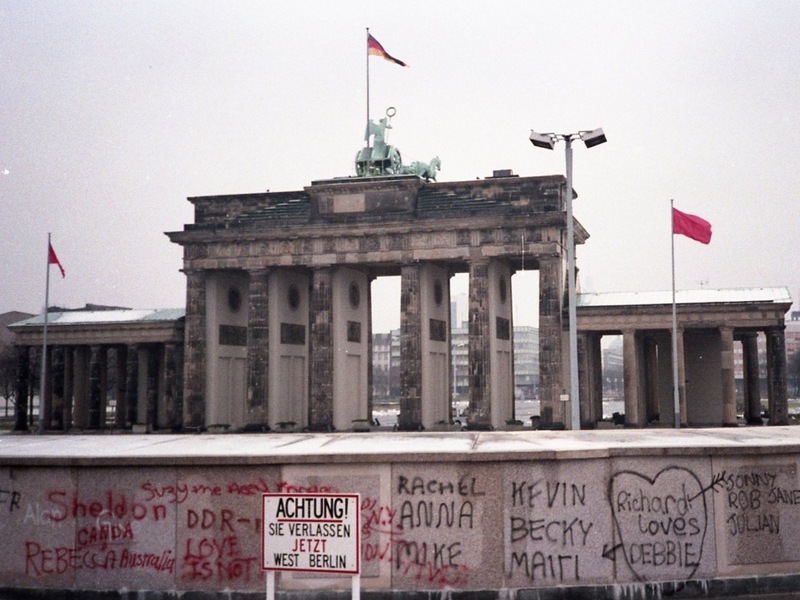 I have wanted to go back to Berlin since the Wall fell (my last visit was in 1989), and Kenna and Celeste have also wanted to go there. We have to get back to London for our flight home on Wednesday, and it turns out to be surprisingly economical to fly from Paris to Berlin, and then from Berlin to London a couple of days later. We took a taxi to Charles de Gaulle Airport, which was very pleasant compared with the stairs and train changes that would be required via public transport. We connected in Frankfurt en route to Berlin. On a recommendation from Rick Steves‘ travel guide, we began by buying Berlin “Welcome Cards” that gave us free mass transit and discounts on many local attractions for two days. We then took the bus to a stop a short walk from our hotel, which is one in which I stayed in 1989, but under a different name. When we arrived at the hotel, I was told that they needed a voucher for payment from the company I had booked the reservation with. I had booked the room from Metz using EasyToBook.com based on the Hipmunk travel app that I use extensively. Apparently EasyToBook had forwarded my booking to another travel agency, which hadn’t sent either me nor the hotel a voucher. And it was Sunday, so the other agency was closed. I called EasyToBook support, and was told that they would try to resolve the problem but in the meantime that I should continue to contact the hotel. I didn’t have much choice about contacting the hotel because I was standing in their lobby! After an hour or so, the desk clerk got through to her manager who authorized us to check in. Needless to say, I was very displeased with EasyToBook and will be contacting Hipmunk to tell them of the experience. 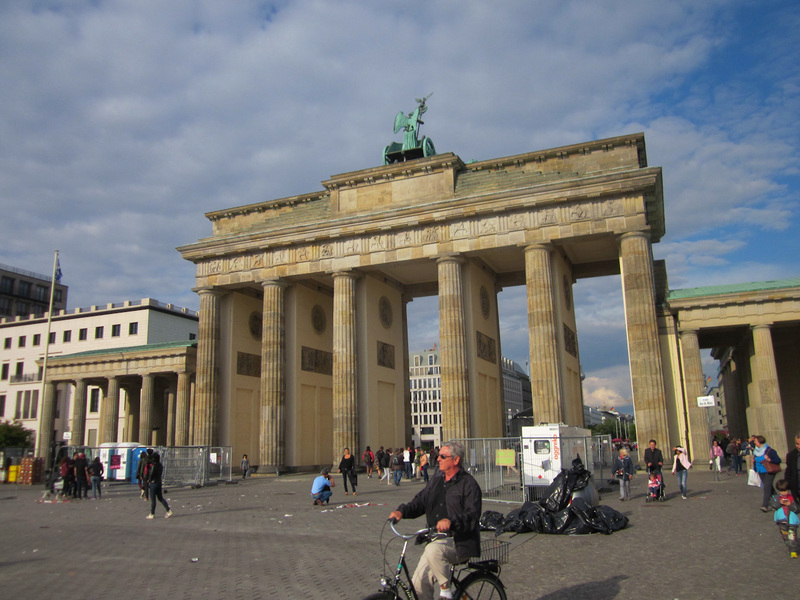 We decided to start our sightseeing at the Brandenburg Gate, which was in the Berlin Wall no man’s land when I last saw it. It was such a contrast: the area is now full of people and activity, a concert having just finished there, lending a festive atmosphere. The U.S. embassy is now adjacent to the Gate in what was East Berlin. I had expected to see people driving through the gate as in the movie One, Two, Three, but it’s a pedestrian thoroughfare now, probably a good thing since the posts won’t accommodate a very wide car. We continued to walk past the Reichstag, and saw a large police presence there. I asked one of them what all of the people were doing, and he said that they were lined up to visit the Reichstag which didn’t seem like the full story. Later we learned that there had been a protest regarding the refugees that are currently trying to enter Europe from Africa. The protesters had dug a few mock graves in the lawn in front of the building, which was now fenced off. Returning to the vicinity of our hotel, we had dinner at Schildkröte, a restaurant that was a favorite from my visits many years ago. It was basically unchanged, and we had a very enjoyable dinner there. It turns out they have been in business since 1936, which is pretty remarkable if you consider what Berlin must have been like then. This article is part of a series about our recent vacation in Europe. To see the introductory article in the series, click here.